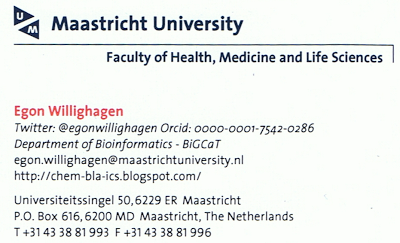 Since I do not know how long, I am again using business cards, very useful at the QualityNano meeting I am now. 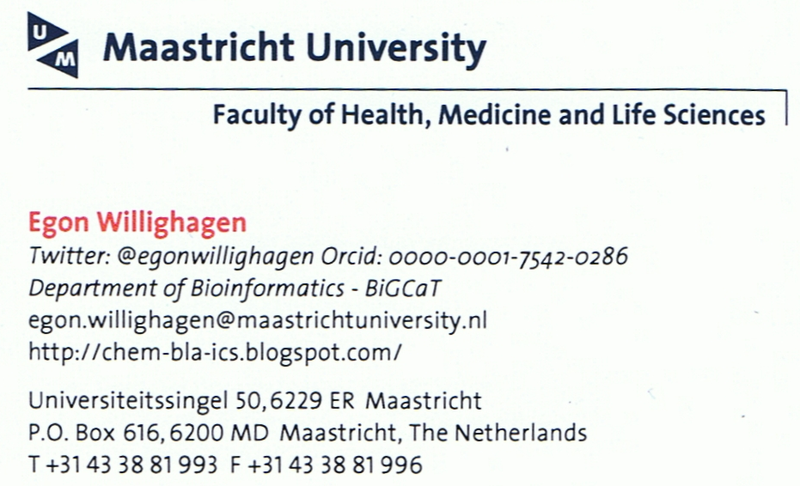 There is a fixed Maastricht University template, with little room for customizations (or so it seems, at least), so no nice QR code pointing to my home page, but I managed to reuse a "title" field to list my twitter account and my ORCID! I flew in this morning and now attending the QualityNano (until recently called QNano, see their announcement on the right) conference in Prague. The meeting attracted over 100 people (probably closer to 200) working in the field of safety of nanomaterials, and the talks are of quite good quality and rather interesting so far. There are many, many posters too, among two of mine. One shows my nanoQSAR work the other showing the Open PHACTS examplars. Several new pathway alternatives were presented, among one signaling pathway which requires a cellular bilayer to function; a single layer of cells does not make the signal possible at all. Some six weeks are left before the ACS spring meeting in New Orleans, aka #ACSNola. I got more abstracts accepted than expected and got a busy program now. Monday 8pm: two posters at Sci-Mix: the above and an Open PHACTS poster (see below). Much of this work is with current and past colleagues and collaborators, such as people from ToxBank, Manchester University, and Uppsala University. But, where is the Blue Obelisk dinner going to fit in?? Spjuth, O.; Carlsson, L.; Alvarsson, J.; Georgiev, V.; Willighagen, E.; Eklund, M. Current Topics in Medicinal Chemistry 2012, 12, 1980-1986. Yeah, that looks like what I asked for :) Thanx, and well done! Book: "Open source software in life science research"
Recently, Lee Harland and Mark Forster published a book called "Open source software in life science research" (see book cover on the right; ISBN-13:978 1 907568 97 8; available from e.g. Amazon) featuring a chapter on Bioclipse-OpenTox, in which we applied our earlier work published (doi:10.1186/1756-0500-4-487) to the Tres Cantos interesting Antimalarial Set, TCAMS, nowadays available from the ChEMBL Neglected Tropical Disease Database. Big thumbs up to Roman who primarily did that part. This book is not Open Access, but three chapters are. Ours is one of them: our chapter is available under the Creative Commons 3.0 Share Alike Attribution (CC-BY-SA) license. Currently, the sources are available as a Word and as Libre/OpenOffice document at GitHub, but I think I will convert that to LaTex later so that I can share a nicely formatted PDF version of the chapter. We used the Mendeley plugin for the references, with mixed experiences. All references are therefore available from this Mendeley group. We plan to keep this chapter updated. That is, when there are significant changes in the OpenTox or Bioclipse platforms, we will update the chapter content to match those chances. Well, that is at least the idea. Of course, everyone who likes to do that is allowed to do it. So, feel free to clone the chapter. Willighagen, E.; Affentranger, R.; Grafström, R.; Hardy, B.; Jeliazkova, N.; Spjuth, O. Interactive Predictive Toxicology with Bioclipse and OpenTox. In Open Source Software in Life Science Research: Practical Solutions to Common Challenges in the Pharmaceutical Industry and Beyond, 1 Ed. ; Harland, L.; Forster, M., Eds. ; Biohealthcare Publishing Ltd: Oxford, 2012.